Dice decor adds personality and unique style to your home or office. I'm a bit surprised there are enough products to make this a big category, but there are because people love dice. From lamps to clocks to rugs and art, your home or office can be enhanced by all things dice. Dice candles set a fun, playful mood. Dice lamps come in a variety of shapes and sizes. You can literally buy a lamp shaped like a die. It sparkles and is made out of a textured rubber. Another creative choice involves stacking dice to make a lamp base. You can buy a lamp with 3 large black and white dice for the base with a white lamp shade. Stunning crystal decorative dice as dice decor would look good on a coffee table, desk or book shelf. They're 1.5" square with dice markings frosted into the glass. Bookends offer another decorative use for dice. These dice bookends with cards add a stylish touch to any book shelf. A dice paperweight puts the "fun" in functional. This one is a globe with different sized dice floating in liquid. To view decorative art for your wall, visit the page on dice art for info on gorgeous pictures, paintings and prints. How about some soft, comfortable decor? I'm talking about a dice pillow of course. It is a piece of decor that you can admire and enjoy. Tick-tock you hear a dice clock! These clocks can take the shape of dice or incorporate a picture of dice on the face. This metal dice clock doubles as a photo frame too. Here's a unique clock for sure. The numbers on the face of this clock are represented by actual dice. You can choose from several colors too. 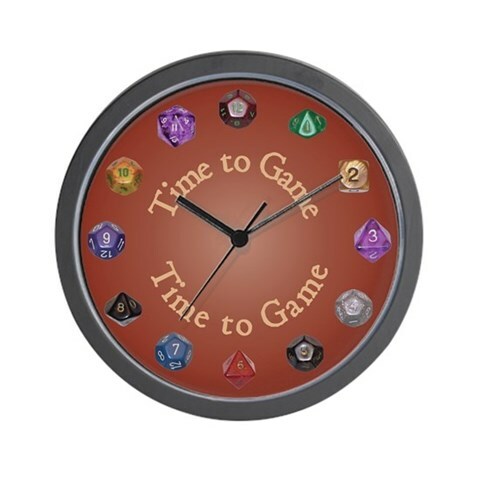 Cafepress sells a clever dice clock, perfect for a fan of dice and role playing games. The numbers on the face are represented by different sided dice with the words "Time to Game" are written in the center. Since they're cube shaped, dice as dispensers make perfect sense. Dice decor inspires designers to create fun, useful products to serve a variety of purposes. Black and white dice salt and pepper shakers make a unique gift for the passionate gambler. Finally, the dice soap dispenser puts an end to gambling on cleanliness.